Welcome to the Making WordPress slack! 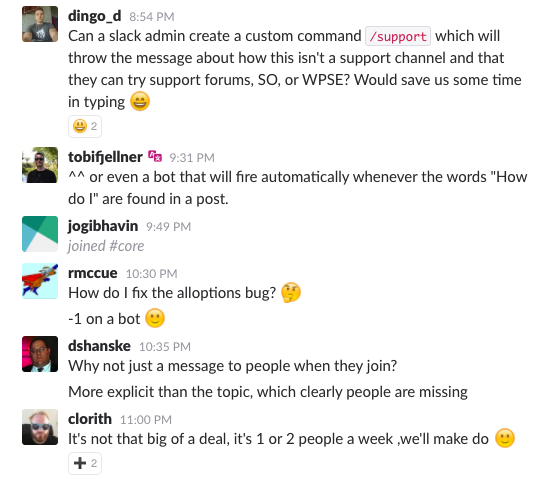 This Slack is for discussion related to the creation of WordPress itself. For general support or questions, please check out the WordPress.org support forums ​https://wordpress.org/support/ or IRC ​https://make.wordpress.org/support/irc-support-channel/. Or find a local slack (​https://make.wordpress.org/polyglots/handbook/about/teams/local-slacks/) and ask your question there if it's related to something local. Hi there, for job postings, please use one of the resources such as jobs.wordpress.net or jetpack.pro. Or find a local slack (​https://make.wordpress.org/polyglots/handbook/about/teams/local-slacks/) and look for a job channel. I don't think we need a bot, just a manually-triggered Slack auto-response. How about we try this out and see how it works? It's manually triggered, so if you don't want to use it, you don't have to. :) Just need a Slack admin to add it to ​https://wordpress.slack.com/customize/slackbot. #3898 was marked as a duplicate. This would be nice, I agree with @melchoyce it should be a manual-trigger and not a bot as they can provide the @username to make it personalized. Most times the community response on these requests is great. But often language barriers or even complete lack of response can lead to confusion and frustration by the WP user requesting support and leaving feeling like they were _doing_it_wrong. And looking up the links for those support links every time takes a minute where the trigger can be done in a second.